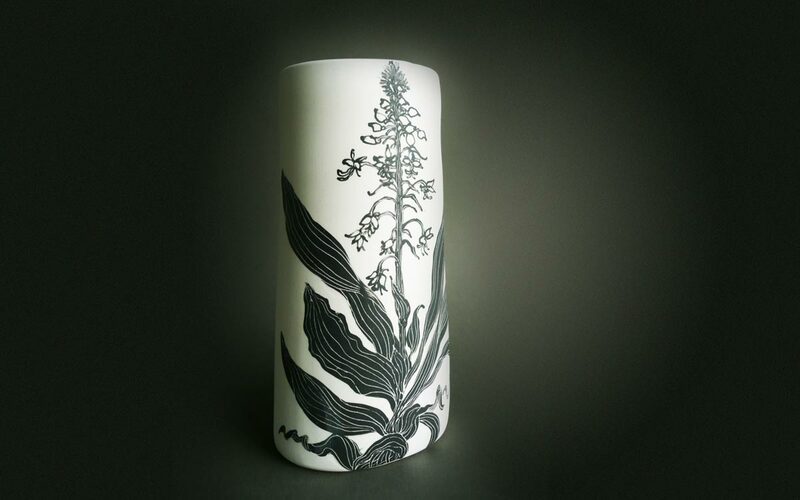 Calanthe, Frances Smith’s striking black and white ceramic vessel has been selected as part of Queensland’s “Cream of the Crop” exhibition. The exhibition was opened in Brisbane by His Excellency the Honourable Paul de Jersey AC as Administrator of the Government of the Commonwealth of Australia. Cream of the Crop is a competitive selection of art works by established and emerging Queensland artists and will be on display at the Judith Wright Centre before touring regional Queensland Galleries. Artists were asked to identify and address a significant theme relevant to their local region or community drawing on personal experiences or observations. Fran’s work was a 40 cm tall thrown and altered porcelain piece which featured a black slip illustration of the famous Queensland Calanthe Orchid. The Calanthe is endemic in the Tamborine Mountain plateau, where Frances lived and worked for many years. Cream of the Crop’s judging Panel included Jan Manton of Jan Manton Art who is also the exhibition Curator, Alexis Tacey from the University of Southern Queensland and Ashleigh Campbell of the Cairns Regional Gallery. The Exhibition will be touring regional Queensland throughout 2016 managed under the auspices of the Flying Arts Alliance. Flying Arts is a 45 year old Queensland organisation dedicated to promoting the “appreciation, practice and professional development of the visual and media arts as a lifetime interest or career”.